This was our first attempt at making coconut shrimp at the house and I’m quite impressed how well they turned out. We made two different sauces for dipping and those were also first-timers and while I liked both, I was more partial to the plum sauce. Spread the coconut out on a plate or a pie pan. Whisk all ingredients except coconut together. 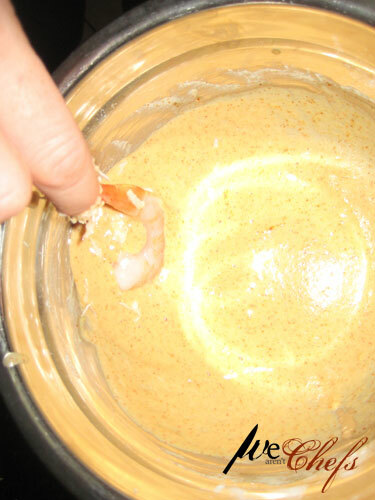 Dip shrimp into batter and then dredge in coconut, coating it completely. Press gently to adhere coconut to shrimp. Heat oil in large pan on stove. Place eight shrimp at a time in the oil and turn after one minute, cook until golden brown (about one minute each side). Pull out and place on towel to remove any excess grease. 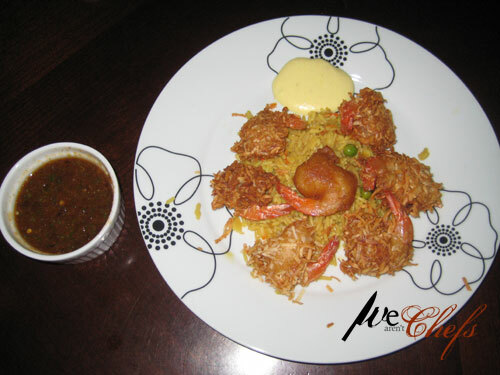 Serve with fresh fried rice and veggies. 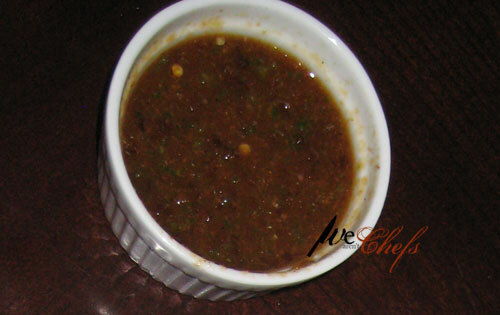 For a dipping sauce, use Sweet Death Plum Sauce or as on the plate, a Dijon Ginger Sauce. When I use to think about cheesesteaks the two that came to mind where the ones you get in the mall, you know the staple mall food chain cheesesteak place that also has fresh cut french fries? Yeah, that place and then Steakums, which thinking back make me wonder what my palette was thinking when I ate those. MMM… school lunch. I found these thin steaks in the meat department and gave it a whirl. I recommend after making these a few times that you do in fact use the Thin Sliced Steaks. Season the steak as you wish (lemon pepper, pepper, salt, red pepper, etc) and let soak in. 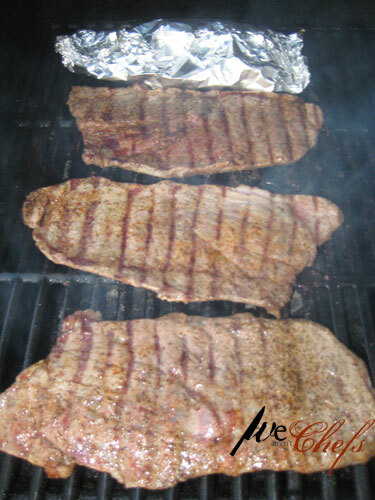 These are great on the grill as well … cook them up in a pan, Foreman type grills work well. In another pan (or on the grill place in tinfoil and add oil on top), add oil, onion, peppers, garlic, and mushrooms. Saute until tender. Once meat is done, slice into thin pieces, top with saute mixture and add cheese. Toss under the broil for a few minutes or until cheese is melted. 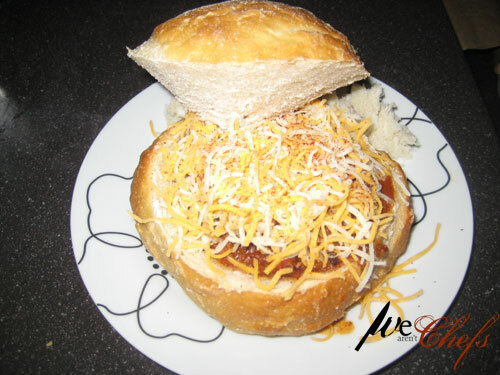 This meal is great served easy with baked beans, veggies, and homemade fries. Cook ground beef, onion, garlic and peppers in large pot. 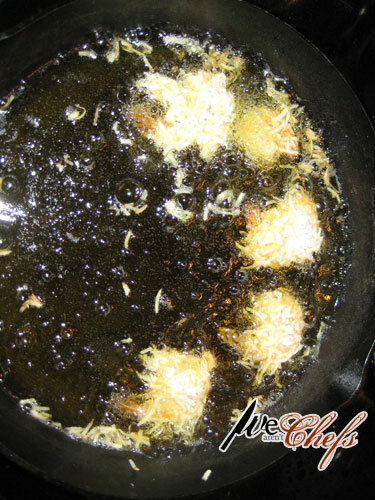 Once meat is cooked and crumbly, stir in remaining ingredients. 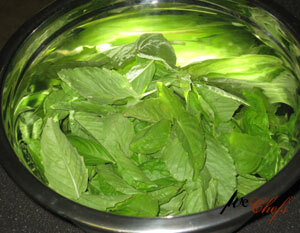 Bring to a boil and reduce heat. Simmer uncovered for 45 minutes to one hour. 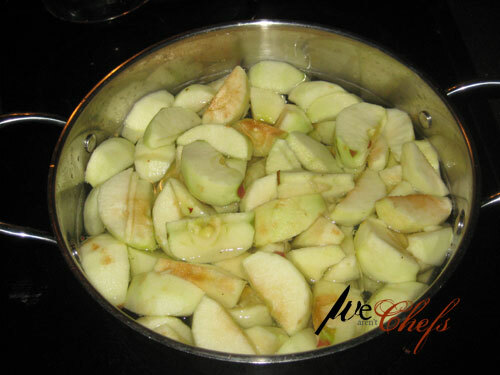 It’s fall time when the selection of apples is plentiful and the weather begins to cool enough that homemade applesauce tastes just perfect. Get a large selection of apples, they can vary in kind. I prefer Macintosh apples but they are only in season during the fall and hard to find out here in Arizona. I can every now and then and they aren’t cheap. 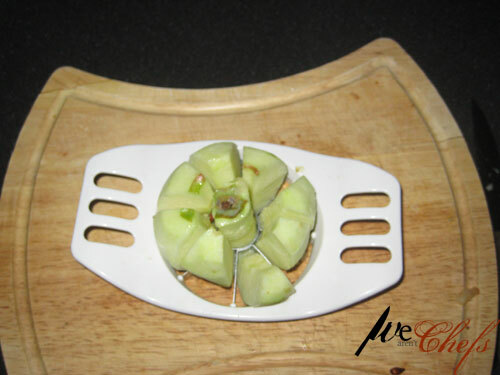 So sometimes it’s good to get a mixture of many apples, saves in money and really adds a good taste. 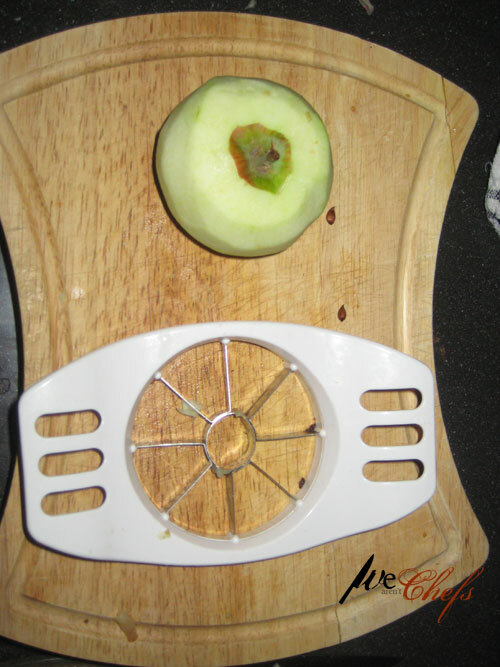 I use my Apple Slicer to make things much easier. And just push down and it will keep the core separate. Works wonders for $1.99. Boil water in a large pot. Add as many apples as you wish, however I warn you that to make a decent amount you need about a dozen of apples. It’s worth to make extra as you just store it in the fridge. 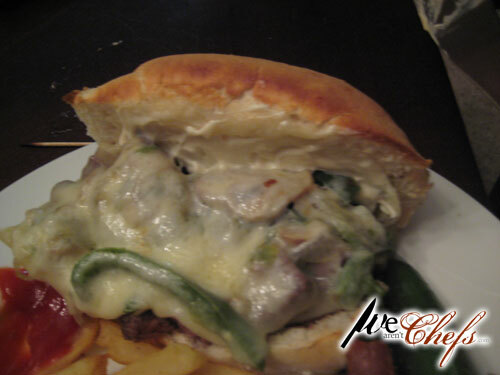 Is great to send with the kids to school for lunch. Once they are soft, drain and place back in pot. Mix up well, I use my Braun Hand Blender and still leave some chunks in it. I add cinnamon across the top and mix that up well. Then you are ready to serve. Is delicious with a nice pork loin or shoulder. I concocted this tonight from my own little brain, it tasted wonderful! We used it as a sauce for our Coconut Shrimp. Mix in blender and there you have it! My friend Linda brought this bread to dinner a couple of weeks ago. It is a wonderful tasting bread. Dough is ready when its surface is dotted with bubbles. Lightly flour a work surface (may need more than light flour depending on how sticky the dough is). Place dough on this and flour the top and fold it over itself once or twice. Cover loosely with plastic wrap for 15 minutes. At least a half-hour before dough is ready, heat oven to 450 degrees. Put a 6-8 quart heavy covered pot in oven as it heats. ( can be cast iron, ceramic, enamel, pyrex) Whendough is ready, carefully remove pot from oven. Slide your hand under towel and turn dough over into pot, seam side up. It will look like a mess but that’s okay. Shake pan once or twice if dough is unevenly distributed, it will straighten as it bakes. Cover with lid and bake for 30 minutes, remove lid to brown and continue to bakc another 15 to 30 minutes. Cool on a rack. A couple of notes from me. I placed an extra towel on the granite counter top because it is so cold. I had to use a metal bowl because I made 1 1/2 batches. You need a big bowl and I will be buying a much larger glass or Pyrex bowl. The metal was fine but I prefer the glass. I also used my Romertopf clay cooker. I soaked top and bottom at least 15 minutes and then placed it into the cold oven; then pre-heated the oven as noted above. Also, you will need to shape the loaf to fit the clay cooker. It is delicious in the clay cooker. I will be buying a cast iron dutch oven to try as well. I also decided to try adding some whole wheat flour. I only replaced 1 cup of flour to see how it tastes. It is heavier but still very tasty. I found I needed a little more flour when I removed it to the counter. It was very sticky and didn’t cooperated much. I found that it comes out great no matter how much of a mess it looks going in. Kristin, I know my grandsons will love this bread. Enjoy. I have found that my boys really like having the menu done as well, they like to know what’s for dinner. Remember that dinner doesn’t have to be complex, all of my recipes are rather simple. This is a quick way to make a nice piece of fish. Spread pesto sauce on salmon and add slices of tomato and onion. Sprinkle some salt and pepper and you are good to go! You can either grill this or broil it, I normally grill it. Depending on the thickness of the fillet will dictate the cooking time. 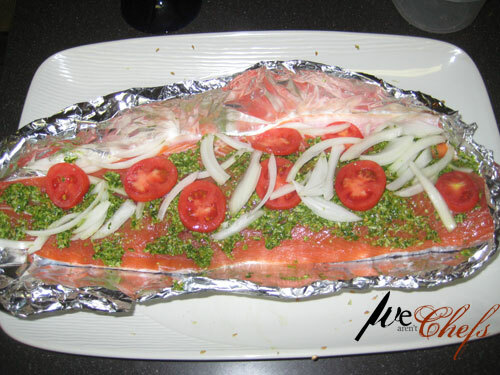 Wrap in tinfoil and cook until fork cuts through it easily and the fish is flaky. This was fun to make for the first time and it turned out great. The fresh ingredients created such a vibrant smell. Simply wonderful. 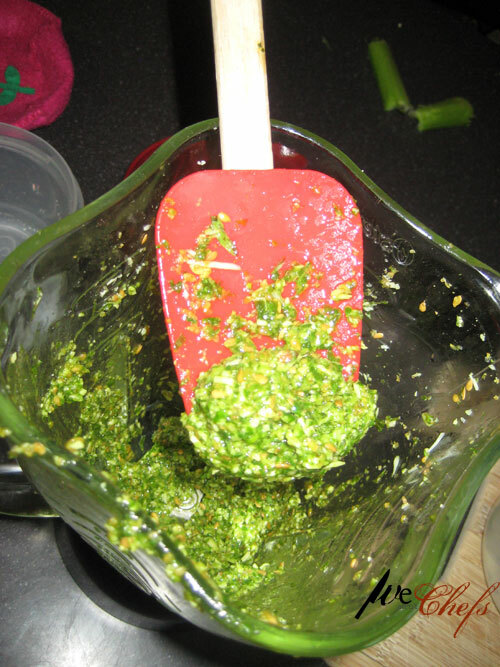 Put in blender or food processor and blend until its mixed together well.